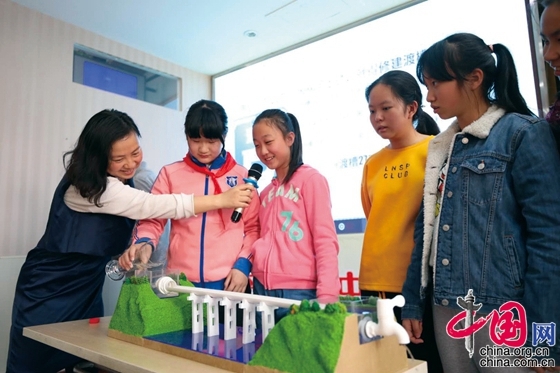 From March 22 to 26, 67 speakers gave lectures at 120 primary and middle schools, universities, and colleges to teach the students about the massive engineering feat and raise water conservation awareness. The lecturers, representing the Construction and Administration Bureau of the Central Route of the South-to-North Water Diversion Project, also introduced the set of regulations on the supply and use of diverted water from the project. Yang Helin, a student from Changjiangxilu Primary School in Zhengzhou, Henan province, said he learned that the water people there drink every day comes from the south of the country as a result of many people's great efforts. "I learned that there is not much drinkable water on the planet, so we must cherish the water resources," Yang said while listing several ways of saving water. In addition to the lectures, six national practical education bases for primary and middle school students along the project's central route also organized 16 learning activities for over 1,000 people.